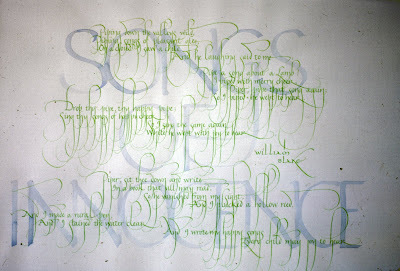 Th earlier post about the book with a passage from William Blake reminded me that I done a few calligraphy pieces of his poems in the past. The introduction to Songs of Innocence seems perfect for a beautiful April day. 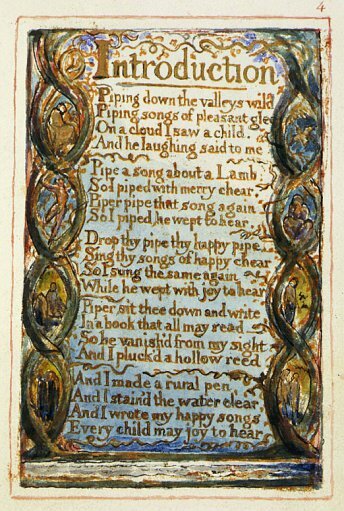 I believe I may have written the background "Songs of Innocence" with a reed pen inspired by the line "And I made a rural pen." I was a big fan of these sweeping descenders and used them whenever I thought it would be appropriate. And sometimes when it wasn't. Looking at it now, it looks kind of congested and I question what I was thinking in the way I wrote William Blake but adding the attribution is always tricky. I always added it at the end and sometimes too quickly, followed by a "Why did I do that?" You can view all the poems here.